A. Charlois discovered asteroid #371 Bohemia. A. Charlois discovered asteroid #437 Rhodia. J. Helffrich discovered asteroid #702 Alauda. Dr. Kurt Wahmke and two technicians were testing a 90% H2O2/Alcohol combination at Kummersdorf, Germany, when the chamber exploded, killing them, the first and only deaths of technicians in the history of German rocket development. K. Reinmuth discovered asteroid #1334 Lundmarka. K. Reinmuth discovered asteroids #1395 Aribeda and #1402 Eri. 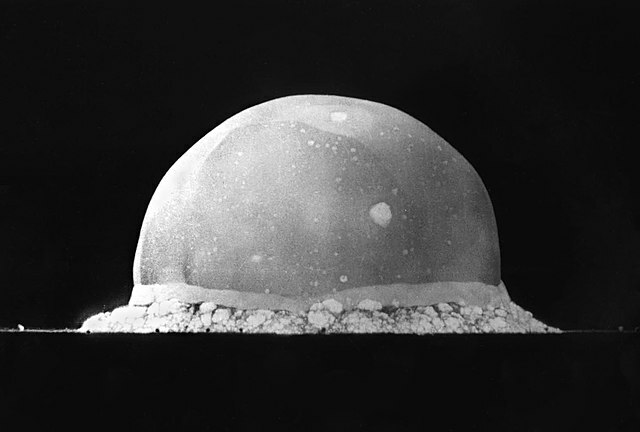 The United States research team working in the "Manhattan Project" successfully detonated a plutonium based test nuclear weapon at the Trinity site near Alamogordo, New Mexico. NASA launched Explorer S-1 from Cape Canaveral, Florida, which went out of control after 5.5 seconds and was destroyed by range safety. NASA and the USAF launched the X-15A Notch/ASAS/Aero drag test mission # 61 in which Joe Walker attained a maximum speed of 5913 kph (Mach 5.57) and reached a maximum altitude of 32.675 km. Five men began a what was planned as a thirty day engineering test of life support systems for a manned space station in The Boeing Company space chamber. The test was halted after only five days, however, because of a faulty reactor tank. At Seattle, Washington, five men began a what was planned as a thirty day engineering test of life support systems for a manned space station in The Boeing Company space chamber on 16 July 1963. The system, designed and built for NASA's Office of Advanced Research and Technology, was the nation's first to include all life-support equipment for a multiman, long duration space mission, including environmental control, waste disposal, and crew hygiene and food techniques. In addition to the life support equipment, a number of crew tests simulated specific space flight problems. Five days after the test was started, however, the simulated mission was halted because of a faulty reactor tank. The first launch of the USSR Proton launch vehicle carried the Proton 1 astronomy satellite to orbit, which initially only transmitted telemetry but later functioned normally and provided physics data on ultra-high-energy cosmic particles for 45 days. NASA and the USAF launched the X-15A WTR/HS/SB/FAB/FP Test/Technology/Aeronomy mission # 196 in which Pete Knight reached a maximum speed of 5443 kph (Mach 4.79) and a maximum altitude of 67.513 km. 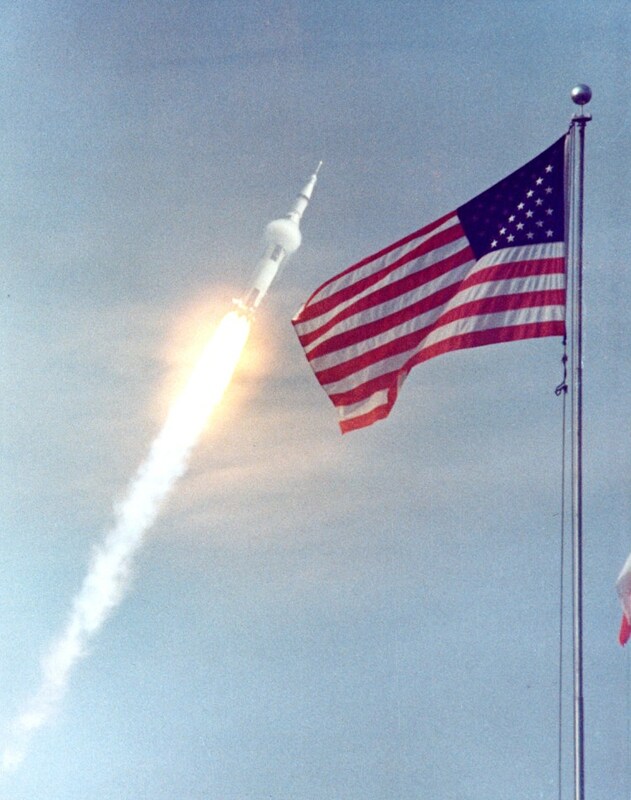 NASA launched Apollo 11 from Cape Canaveral, Florida, crewed by Neil Armstrong, Buzz Aldrin and Michael Collins, the flight in which the first humans (Armstrong and Aldrin) landed on the Moon. Apollo 11 after pitchover, NASA photo. Note the condensation cloud formed in air expanding aft of the second-stage/third-stage transition. USSR launched the Meteor 1-9 weather satellite from Plesetsk to acquire meteorological information needed for use by the weather service. NASA launched the ITOS E weather satellite from Vandenburg, California, an improved TIROS Operational System, but the satellite failed to achieve orbit because of a second stage failure. ITOS-E was one in a series of improved TIROS-M type satellites launched with new meteorological sensors on board to expand the operational capability of the ITOS system. The primary objectives of the ITOS-E meteorologcial satellite were to provide global daytime and nighttime direct readout cloudcover data on a daily basis. The sun-synchronous spacecraft was also capable of supplying global atmospheric temperature soundings and very high resolution infrared cloudcover data for selected areas in either a direct readout or a tape recorder mode. A secondary objective was to obtain global solar proton flux data on a routine daily basis. The primary sensors consisted of a very high resolution radiometer (VHRR), a vertical temperature profile radiometer (VTPR), and a scanning radiometer (SR). The VHRR, VTPR, and SR were mounted on the satellite baseplate with their optical axes directed vertically Earthward. The nearly cubical spacecraft measured 1 by 1 by 1.2 m, and was equipped with three curved solar panels that were folded during launch, to be deployed after orbit was achieved. Each panel measured over 4.2 m in length when unfolded, and was covered with 3420 solar cells measuring 2 by 2 cm. The ITOS dynamics and attitude control system were to have maintained desired spacecraft orientation through gyroscopic principles incorporated into the satellite design. Earth orientation was to be maintained by taking advantage of the precession induced from a momentum flywheel so the satellite body precession rate of one revolution per orbit would provide the desired 'Earth-looking' attitude. Minor adjustments in attitude and orientation were to have been made by means of magnetic coils and by varying the speed of the momentum flywheel. The spacecraft was launched on 16 July 1973, but failed to achieve orbit because of a second stage booster failure. Felix Aguilar Observatory discovered asteroid #2964. Germany's Aeros 2 spacecraft was launched into orbit from Vandenburg, California, for upper atmospheric research. NASA launched Landsat 4 from Cape Canaveral, Florida, designed as a major step forward in global remote sensing applications. Landsat 4, launched 16 July 1982, was an experimental Earth resources monitoring system with the new powerful remote-sensing capabilities of the thematic mapper (TM), and provided a transition for both foreign and domestic users from the multispectral scanner (MSS) data to the higher resolution and data rate of the TM. It had a complete highly automated end-to-end data system, designed to be a new generation system, and a major step forward in global remote sensing applications. The Landsat 4 mission consisted of an orbiting satellite, the flight segment, with the necessary wideband data links and support systems, and a ground segment. The Landsat 4 flight segment consisted of two major systems: (1) the instrument module, containing the instruments together with the mission unique subsystems, such as the solar array and drive, the TDRS antenna, the wide-band module (WBM), and the global positioning system (GPS); and (2) the multimission modular spacecraft (MMS) that contained the modularized and standardized power, propulsion, attitude control, and communications and data handling subsystems. The satellite was designed with a nominal life of 3 years in orbit, and could be extended through in-orbit replacement capability when the Space Shuttle became operational. The spacecraft was placed in an orbit with a descending node equatorial crossing between 9:30 and 10:00 am local time. The spacecraft and attendant sensors were operated through the GSTDN stations before the Tracking And Data Relay Satellite System (TDRSS) was available. An identical back-up spacecraft, Landsat-D Prime (NSSDC ID Landsat-E) was placed in storage, and launched on 1 March 1984. On 1 October 1982, NOAA assumed responsibility for Landsat data production and archiving activities at the Department of Interior's EROS Data Center. On 31 January 1983, NOAA also took over the MSS operation and maintenance of the Landsat spacecraft and ground system resources from NASA. The RBV operation was under NOAA as of 1 October 1984. USSR Soyuz T-15 landed 55 km northeast of Arkalyk, returning from the Mir space station (Mir EO-1 mission). USSR launched the Cosmos 1869 oceanographic radarsat from Plesetsk for acquisition of operational oceanographic information in the interests of various branches of the national economy of the USSR, and international cooperation. The first launch of the new Chang Zheng 2E Chinese launch vehicle carried the experimental Pakistani Badr-A comsat and an HS-601 model to orbit from Xichang. The first fragments of Comet Shoemaker-Levy 9 collided with Jupiter; the bombardment continued through July 22. The US Air Force launched Navstar 2A-17 (USA 126), a GPS Block 2A satellite, from Cape Canaveral, Florida, which was placed in Plane E Slot 3 of the Global Positioning System constellation. Russia launched the Progress M-42 logistics spacecraft from Baikonur to the Mir space station. Progress M-42, launched 16 July 1999, delivered supplies to the crew of the Mir complex. It docked with the Kvant port at 17:53 GMT on 18 July, and remained docked to the station after the departure of the last operational crew in September 1999. Progress M-42 undocked from Mir on on 2 February 2000, to clear the port for Progress M1, at 0311:52 GMT, and was deorbited over the Pacific later the same day at 0610:40 UTC with an 8 minute burn. The US Air Force launched Navstar 48 (USA 151), a GPS Block 2R satellite, from Cape Canaveral, Florida, which was placed in the Global Positioning System constellation in Plane B Slot 5. A Soyuz 11A511U booster launched from Baikonur carried ESA's Samba and Salsa magnetospheric research satellites to orbit. The first two European Space Agency (ESA) Cluster II satellites, Samba (FM7) and Salsa (FM6) were launched 16 July 2000 into an initial 200 km, 64.8 deg circular orbit. The Fregat upper stage then burned once before ejecting the satellites into a 250 x 18072 km x 64.7 deg transfer orbit. Both satellites then used their Astrium (former MBB) S400 liquid engines in a series of four additional burns before reaching their final 16869 x 121098 km x 90.6 deg orbits. Each magnetosphere research satellite then deployed four 50-meter wire antennas to collect experimental data.